The Richter company also made puzzles and games from the same stone material as the Anchor stones. For this reason a few Anchor stone collectors are also puzzle Anchor collectors, and most all Anchor people have a several of them. The most important of the Anchor puzzle collectors is Ad van Selms, Den Haag, Netherlands. 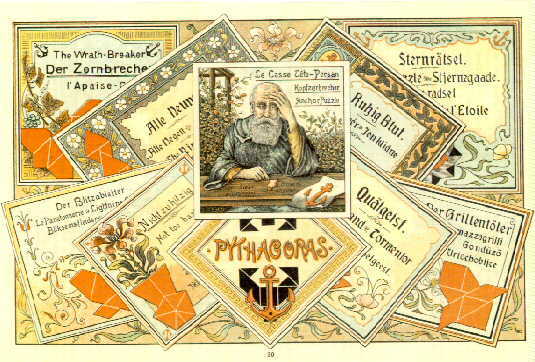 On the right is a collage of puzzle labels from a Richter catalog. There were about 40 different puzzles, all of the "dissection" type. People interested in puzzles, including Anchor puzzles should check out the puzzle web page. This edition of the Anchor web page marks the first year of exposure on the world wide web. It has been quite a success for the Anchor community. The Club of Anchor Friends has added more than a dozen (net) new members. Most of these new members are attributable to the Internet and this web site. This year will end up with about 3,000 hits. Many hits are repeat viewers -- those who want to see the new buildings by the master builder features that month. A few may even want to see my own creations. Some want information. I am especially happy with the number of new to Anchor people who are now becoming collectors and builders. Anchor collectors are different from Erector Set collectors in that almost all Anchor collectors are also builders. In that way they are more like Meccano collectors, and many Anchor collectors are also Meccano and Lego builders (but not me). Sets are being produced again! Their quality is high. I urge people interested in starting Anchor building, and those who want to provide their educational benefits to their children, to consider buying these new sets. Web Page Notes: Please note that this home page is under constant revision. The graphics are JPEG, which improves quality and reduces file size. I have used the savings from this graphics format to enlarge some pictures and add additional ones. For the month of August, 1997. You are visitor number to the Club of Anchor Friends' home page since the posting date of . From the first appearance of the Anchor home page, August 30, 1996, there has been a slow but steady increase in the number of people accessing it. Over the previous eleven months there have been about 2,600 visitors. This revision is the twelfth one I have posted on the net. (My first effort was up only four days, when I learned how to display graphics; May and June were up for a total of three months.) The Date and Time is . I have planned to update this site monthly, and with the exception of a delay at my ISP in posting June, the postings have been on time. I think that it has been a mistake to leave the same page up for 50 days. Without making any promises, I do not plan to do it again. It was last updated on .